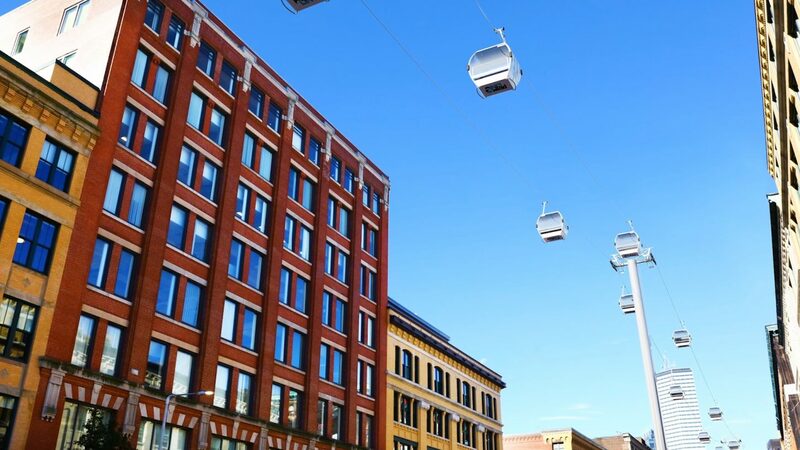 Two private development firms are moving forward with plans for a $100 million gondola in South Boston, which would feature three stations in its first phase. Millennium Partners and Cargo Ventures are building a 2.7 million square foot mixed-use development at the eastern edge of the Seaport District, a part of the city historically under served by public transit. The current Silver Line bus rapid transit lines here have been criticized since their inception as slow, overcrowded and inconvenient while a gondola would create a quick and efficient path to the new complex and beyond. Millennium is working with Handel Architects and Leitner-Poma on a design which it presented to the Boston Planning and Development Agency in January. The latest route avoids cabins flying past rooms at the new $550 million Omni Hotel, a source of criticism for an earlier route proposal, which is somewhat ironic considering Omni’s hopes to build its own gondola at Bretton Woods in New Hampshire. 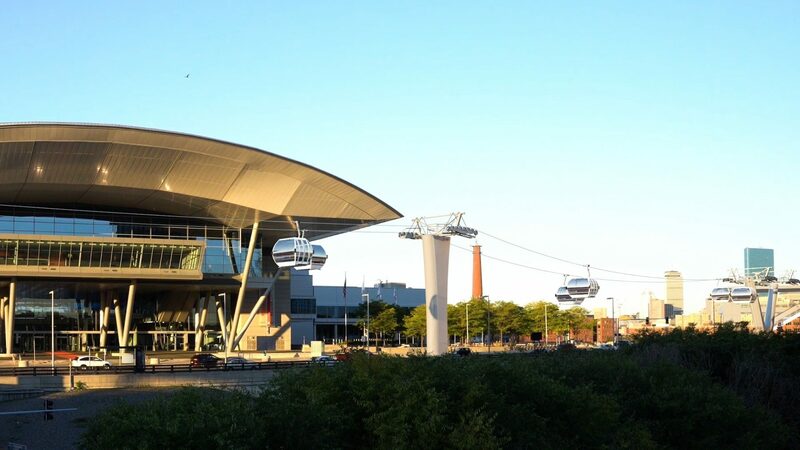 The Boston gondola would travel over Summer Street for its entire 4,650′ alignment with stations adjacent to the South Station transit hub, Boston Convention & Exhibition Center and Marine Park. The lift would feature 13 towers, 70 10-passenger cabins and a capacity of 4,000 passengers per hour, per direction (nine second spacing!) A ride between South Station and Marine Park would take just 7.3 minutes. A second phase could service the South Boston neighborhood with the Marine Park terminal becoming a sharp angle station. Cabin parking and maintenance would also be housed at Marine Park. This proposal is one of many urban gondolas envisioned for North American cities including Albany, Vancouver and Washington, DC. It will be interesting to see which one will be the first to actually break ground. Previous Article As The Hermitage Faces Foreclosure, What About the Lifts? This is a LPOA design-build yet the rendering appears to be a Doppelmayr D-Line. Proof that PR folks have no clue about lifts. They look like LPA tower heads and CWA Omega cabins to me. As far as renderings go, these are actually pretty realistic! Given that they got the hangers and the doors going the right direction, it’s one of the better ones I have seen. 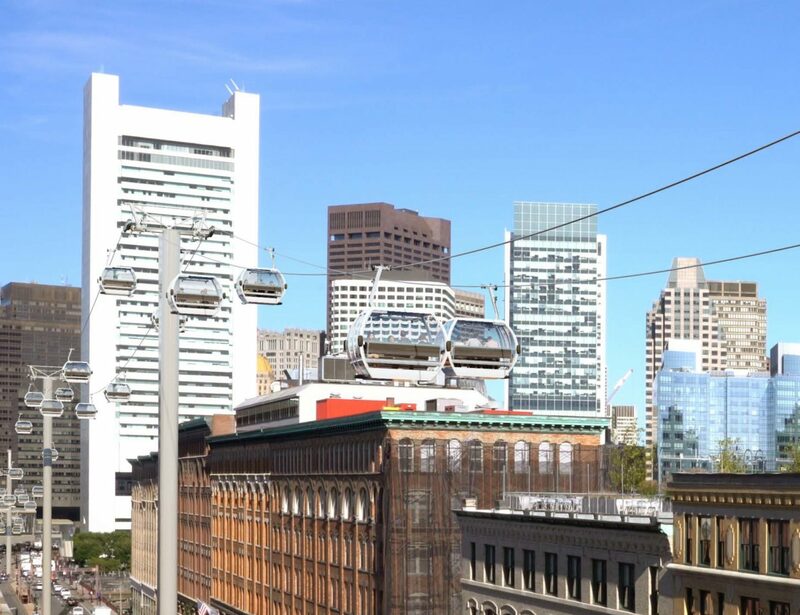 I would LOVE to see this project become a reality, but the gondola would still have the same level of inconvenience as the Silver Line if you are coming from or going to the Green/Orange/Blue Lines on the T.
Re: Boston, we’re cautiously optimistic but all its about the numbers and neighborhood acceptance. This project is GENIUS!!! 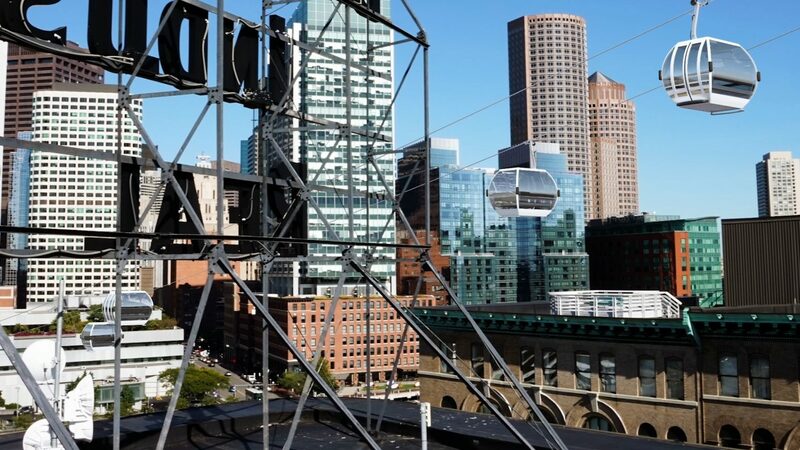 Why ride through traffic on a bus when you can soar above the streets of Boston in a gondola cabin. This would be awesome, but I just hope the MBTA doesn’t run it. They can’t do anything right. They cancelled seemingly every train for a few weeks during a bad snow year a bunch of years ago (2014-15?) and full service still has not been restored. I would hate to see what they would (or wouldn’t do) operating a gondola, which would be by far the most complex machine in their fleet. They just will not be able to under-staff a gondola the way they can their busses and trains. It’s a great idea and I would love to see it become a reality, but I don’t think it will. There will be too much local opposition, everyone would complain that it is an eyesore. As practical and efficient (both in terms of capacity and energy) as it would be, it just seems “too practical” for it to actually take place in Boston. As big a fan of urban gondolas as I am, as a Bostonian I am sadly skeptical that this is a useful place for one. The Summer St corridor is not generally horribly congested and has a couple of bus lines running its length as well as the Silver Line BRT (which actually is mostly BRT here) a short block away. I strongly suspect Millennium Partners of being more motivated by the coolness factor than anything else.